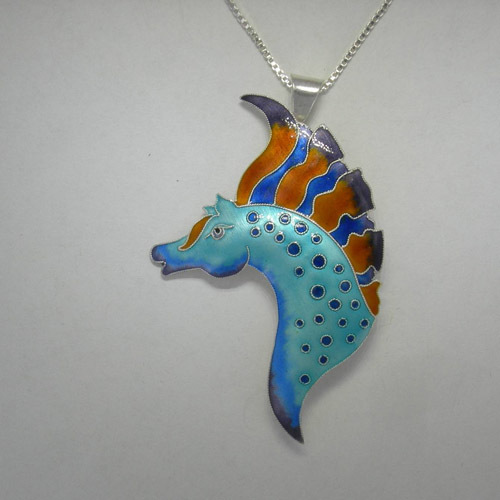 Desc: Sterling Silver Dream Stallion enamel horse head necklace. The Sterling Silver box link chain has a spring ring clasp. 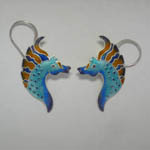 The horse head has fanciful blue color with dark blue spots enamel. The mane and forlock is flowing free and is fire red and blue enamel. The Dream Stallion can be worn as a brooch or as a pendant. The necklace has a bright polish finish. We have a matching pair of earrings, see SK936.